The New Jersey Center for Wine Research and Education (NJCWRE) is an organization within the Rutgers New Jersey Agricultural Experiment Station dedicated to serving the New Jersey wine industry by generating and relaying current science-based information, and by unifying industry members and those who serve the wine industry from throughout the region. The NJCWRE website provides information resources for the industry including: grape growing and winemaking recommendations and technical tools, an exchange platform for commercial grape and wine producers, regulatory & legal pages, a blog to share current findings and wine industry happenings and job opportunities, and educational resources for students and educators. The mission of the New Jersey Center for Wine Research and Education is to facilitate the growth and development of the New Jersey wine industry by nucleating and coordinating broadly based research and educational programs for the wine industry. 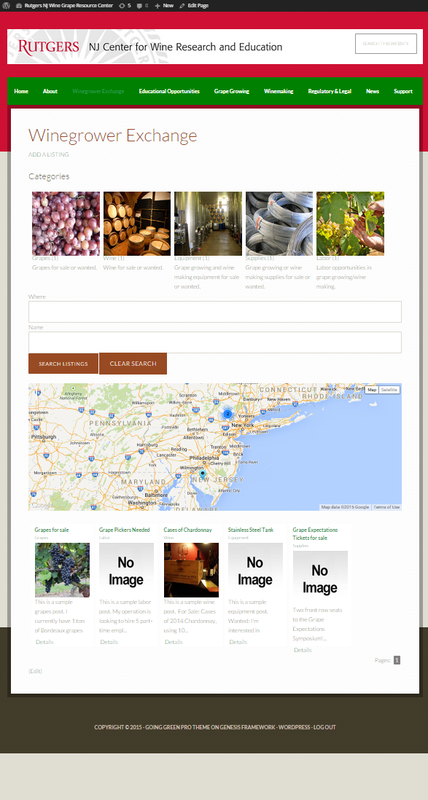 The Winegrower Exchange is a special platform for industry members to post wanted and for sale listings. It is designed to promote the efficient exchange of vineyard and winery products and services. Please contact us at njcwre@gmail.com with any questions.